My layout is in a garage, but my Macintosh is inside. Whenever I set up an operating session, I have to print out the various reports and carry them out to the garage to check that cars are in the correct locations, and if they're not, I need to march back into the house to change the car locations. The View Switchlists on iPad feature gives me a way to avoid wasting paper and waiting for the printer to finish when I need the various reports. Turning this feature on in the Preferences dialog box ("Display Web Server Control Panel") displays a new "Web Server" panel whenever SwitchList is running. 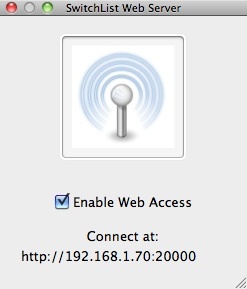 In this panel, you'll see a control for enabling and disabling web access, and the web address for viewing switch lists when SwitchList is running. This server can only display SwitchList data. By connecting to the web site that it names from an iPad or other computer on the same home network, you can view the trains and freight cars on your layout. The "View Switchlists on iPad" feature is still under development. You can currently view switchlists, view car locations, mark trains as complete, and change car locations. Let me know if you find this feature interesting, or have ideas for other cool features for SwitchList!